Who is Maggie Greene on the Walking Dead? 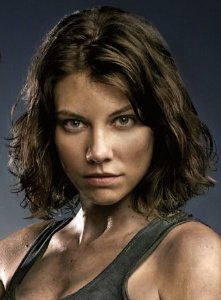 Maggie Greene is a character in the Walking Dead comics and TV series. In both the TV series and comic Maggie ends up being the last survivor of the Greene family. She is played by actress Lauren Cohan. Glenn Rhee - Walking Dead cosplay! Maggie is farm hand on her father's farm at the time of zombie apocalypse. Her family meets and becomes intertwined by another group of survivors led by Rick Grimes. Though the family and the group initially have some problems overtime they grow into one large family. Early on she is shown to be insecure and constantly worried about what other people think about her. One of the survivors of Rick's group is Glenn who Maggie finds herself attracted to. Her father catches the two young birds sleeping together and intially is furious. Overtime he comes to accept their relationship and even encourages their marriage as husband and wife. After scirmishes with zombies and the army of the tyrannical town of Woodbury all of Maggie's family are killed. They find themselves moving from the Greene farm to a prison, to eventually the road, to being hunted to cannibals to eventually finding the Alexandria community. During the time after the Prison, Maggie finds herself in a highly depressed state as she realized her father and brother died. She tries to commit suicide. She is rescued by Glenn. For a time the pair have problems as Maggie struggles to come to terms with the death of her family and her own security. Glenn becomes angry at Maggie's aloofness and lack of intimacy. Maggie becomes and Glenn's willingness to go on dangerous supply runs. Maggie adopts Sofia as her own child in part to ease the pain of losing her own family. Eventually, the two settle these issues and become productive members of the Alexandria community. Maggie finds that she is pregnant with Glenn's child. Glenn and Maggie's relationship seems to be improving when they run into Negan and the Saviors. Negan bashes in Glenn's skull in front of the group brutally killing him as part of a ritual of initiating a new group into the Saviors. Maggie goes to a new community of Hilltop. The leader, Gregory of the community plans to betray Rick to the Saviors. Maggie steps up to him and punches him in his face. When he tries to reproach her she punches him again. She then takes control of the town and leads it during the War against the Saviors in an event known as All Out War. She is supported by the 2nd in command of Hilltop, Paul Monroe. After this time her leadership is again questioned by Gregory who attempts to poison her. However, he bungles the poisoning and she survives. Laughing at how Gregory is even too incompetent to assassinate her right she executes him. She promises the town that this is not the start of a trend but simply a necessary ugly thing. The TV version of Maggie was shown as being mentally stronger earlier. Where as the comic version spent much of the early part of the apocalypse unsure in herself and also suicidal the TV version has been a leader. The comic version of Maggie adopts Sofia however Sofia is dead in the TV version. In both versions Maggie is highly devoted and in love with Glenn.